One live show is worth more than any # of words and is how I get the vast majority of my work. You are most welcome to come see me at upcoming appearances below. If you'd like to attend a non-public performance, please let me know as I can make arrangements for you to be a guest. To see events in the years beginning in January 2014, just go back in the calendar above. You can take home some of Jackson's memorable characters with audio and video performances available for purchase. Rudyard Kipling, who loved to have fun with the English language, wrote his famous "Just So" stories for his "best beloved," his children. Ever since, these stories have been loved by generations of children and adults alike. In this series, Jackson re-tells the stories exactly as they were written and in a performance style that Mr. Kipling himself would love to hear and watch. Stories include: How the Whale Got His Throat, How the Camel Got His Hump, How the Rhinocerous Got His Skin, and The Elephant's Child. Produced by Chip Taylor. Experience a memorable raft of characters from the Maine coast. Among others, there's Charley, who "sees some mighty strange things when is FUI (Fishing Under the Influence)," Old Randall, who everyone knew was "dumb as a hake," Sam, who thought he'd seen a German submarine, and Gray, who thought he'd seen his last. From "The Darker Side" of eerie fogs and loved ones lost at sea, to "The Lighter Side," a delightful compendium of spoken and sung ballads. Featuring the writing and musical talents of Ruth Moore, Gordon Bok, Benny Rehl, and others. If you've seen and heard Jackson's characters live, then you'll be sure to want one or more of his wacky alter egos to answer the phone while you're away. Greet incoming calls with Wolfman Jackson, comedic slices of favorite tv shows, or Shakespoof. Or, have Jackson create a special message just for you, your group or organization. 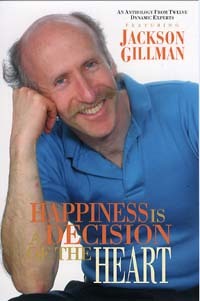 "HAPPINESS IS A DECISION OF THE HEART"